Melbourne's heritage is unique, and specialist investigations into historical and Aboriginal cultural heritage have provided an understanding of the Metro Tunnel project area. The word 'heritage' reflects a special kind of value given to a place. Heritage is our inheritance from past generations and there are reminders of Melbourne's rich cultural history all around our city. Historic, or 'built heritage', includes places and objects dating from the years of Melbourne's post-contact history, including buildings, monuments, gardens and designed landscapes, and industrial and archaeological sites. Aboriginal heritage includes culturally and spiritually significant places for past and present Aboriginal communities. These continue to be places of spiritual and community activity today and include sacred sites, ceremonial sites, scarred trees, campsites and settlements, and places important to stories and traditions. Due to the scale and location of the Metro Tunnel, construction activities and new infrastructure will be located near places of historical significance. Introducing new above-ground infrastructure in places with heritage values. The project's Urban Design Strategy will ensure new stations and entrances, ventilation structures and other above-ground infrastructure are sympathetic to heritage values and local character. The Metro Tunnel project covers an area rich in history including places listed on the Victorian Heritage Register. As most of the project is built underground, many heritage places will be largely unaffected. Measures will be taken to avoid impacts on significant historic buildings such as the Melbourne City Baths, the State Library of Victoria, St Paul's Cathedral, Princes Bridge, Young and Jackson Hotel, Melbourne Town Hall and the Shrine of Remembrance. Changes to heritage places, such as Flinders Street Station, will be needed to accommodate infrastructure including entrances and connections to the new stations. Careful design and construction alongside input from specialist heritage advisors would help to safeguard the heritage values of these buildings and places. Constructing the Metro Tunnel involves removing a limited number of locally significant buildings. This includes the Port Phillip Arcade in Flinders Street, a series of buildings in Swanston Street, and a group of railway workshops in North Melbourne near Laurens Street. Where buildings are to be removed, the project will record the history of these sites for archival purposes. A heritage interpretation strategy for the project will capture historical and Aboriginal cultural heritage themes, recognising heritage places in the design of the new stations. Impacts on landscapes and gardens in the Metro Tunnel project area are likely to be mostly short term. 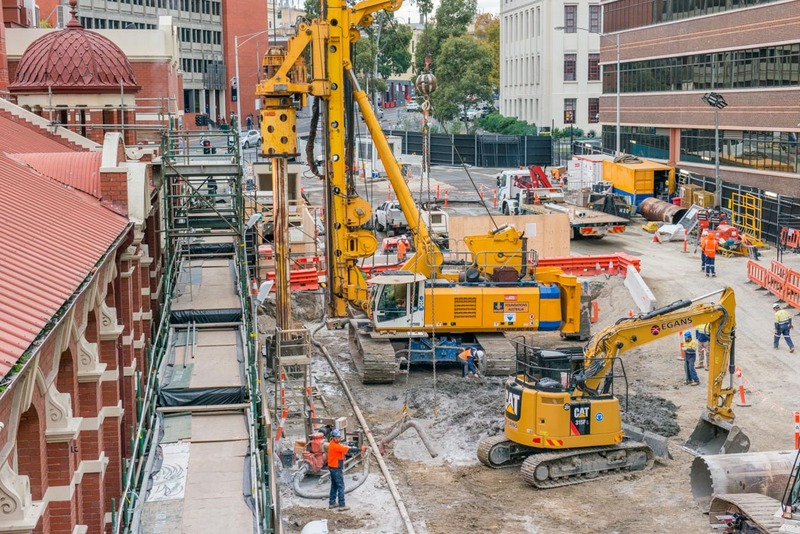 Construction will require changes to aspects of some heritage landscapes, including removal of some trees from Royal Parade, St Kilda Road and Domain Parklands. Mitigation measures aim to retain and protect as many trees as possible and to reinstate or replace trees where removal is required for construction. In all cases, the project's objective is to reinstate the valued heritage landscape character of these areas. Anzac Station will have an entry point on the edge of the Shine of Remembrance Reserve grounds. The design of the station entrance will be respectful of the heritage context, and strict environmental controls will be used to protect this important community asset during the construction and operation of the Metro Tunnel. The South African Soldiers Memorial, previously located in the reserve at the junction of St Kilda and Albert roads, is one of a number of monuments that have been relocated to facilitate the construction of the Metro Tunnel. We recognise the importance of this monument and are working closely with the Boer War Memorial Association, Heritage Victoria and the City of Port Phillip to determine an appropriate permanent location it at the completion of works. 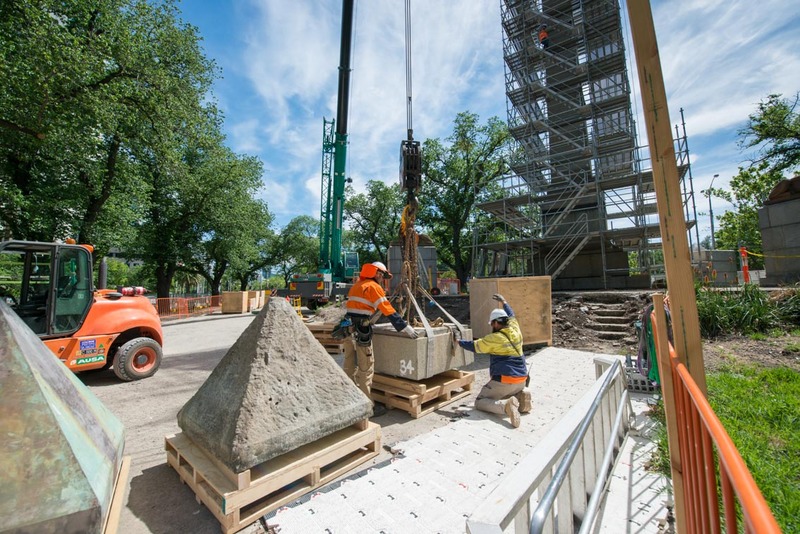 The Burke and Wills monument near the corner of Collins Street and Swanston Street has also been removed and will be reinstated following the completion of works. While a number of areas within the proposed project boundary have a rich and extensive Aboriginal history, the assessment conducted for the EES has determined that building the Metro Tunnel will have a limited impact on Aboriginal cultural heritage. This is because the majority of the project will be constructed underground, at depths below where cultural artefacts or areas of heritage significance will be found. Additionally, most areas where construction will take place have been subject to extensive development over the past century. However, there may be the potential to impact on unknown Aboriginal cultural heritage values. We are working with Traditional Owner Groups to assess Aboriginal cultural heritage. Further archaeological investigation and consultation with Traditional Owner Groups will help define the potential nature and extent of any unknown Aboriginal cultural heritage. Sub-surface test excavation will be used to establish whether Aboriginal cultural heritage is present in areas where ground surface disturbance will occur through construction. A number of mitigation measures have been identified to avoid, reduce or offset environmental impacts. These measures form the basis of the recommended Environmental Performance Requirements for the Metro Tunnel and have been recommended by specialists through the EES process. Compliance with a Cultural Heritage Management Plan that has been approved under the Aboriginal Heritage Act 2006 and prepared in accordance with the Aboriginal Heritage Regulations 2007. Undertaking condition assessments of heritage places prior to commencement of construction where located within the identified vibration and ground settlement zones of sensitivity. Developing and implementing appropriate protection measures for heritage places and objects including sculptures, memorials, monuments and associated heritage fabric where retained in proximity to construction. Development to be done in accordance with the project's Urban Design Strategy, which requires consideration of existing landscape character values, such as heritage places.